OYO DoubleFlex Black is a total body personal home gym for different parts of your body, including back, chest, biceps, triceps, abdominals, buns and lower body. Without using any weights, it is claimed to offer pretty much the same benefits of working out with weights. You’ll find the patented SpiraFlex technology that was used on NASA astronauts for a decade and DoubleFlex activation hitting the opposite parts of the muscles with each movement. And you’ll be able to strengthen, tone and shape your body in less time. The best thing about it is it is very lightweight and as folded up fits into your pocket purse or backpack which makes it great for travels. You can use it easily in your short breaks at work as you’ll find the quick five-minute workouts in the box. The lean muscles that you create will burn fat even when you’re resting. You will get leaner and stronger in a shorter period of time. Even though it weighs less than 2 pounds you can expect as much as 25 pounds of resistance. And this resistance is adjustable to 10, 15, 20 and 25 pounds without using any resistance bands or free weights. It is good for home, office, hotel room or outdoor use, so you can use it whenever and wherever you want. By adding the FlexPacks into your routines you will be increasing the resistance and intensity. You can add it to your different types of exercises including treadmill, boot camp, pilates, yoga and indoor cycling. According to a 16-week long research commissioned by NASA claims that it offers the same lean muscle building benefits of free weights. It is a very sturdy and functional piece of equipment that offers a very easy and effective form of exercise and you’ll love to take anywhere with you. If you are a frequent traveler you’d know how hard it may be to follow your workout routine, staying at the hotels or being on the road. You will find this one extremely convenient and useful to own and you can do quick five-minute routines here and there. If you have a sedentary lifestyle and spend a lot of time sitting in front of the TV, for example, you can do your workout while watching TV, sitting or standing. OYO DoubleFlex seems to offer a good deal of resistance, and even more so with the added FlexPacks. It is suitable for use by younger and older people as people with lower levels of fitness can stick to lower resistance levels. It is actually good for anyone with a busy schedule and very little time to work out at a gym. You will lose weight and calories, strengthen and tone muscles and tighten up nicely overall. But your results will be better and faster if you combine it with a healthy eating plan. 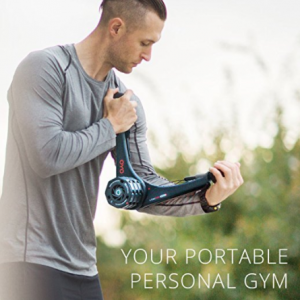 In the box, you will get the Oyo DoubleFlex, door attachment, leg attachments, a wall-sized workout chart, an exercise DVD, drawstring bag and a product guide that includes a nutrition guide and Nick Bolton’s exercise programs. The company stands behind their products and offer a solid two years of warranty along with a 90-day money back guarantee. This warranty covers any broken or defective parts as well as the return shipping cost.